Thanks for letting us know of Doris's passing and for this tribute and bibliography. Doris was such an important voice for those of us who love, study, critique, and share literature for young people. I learned so much from her and cite her often in my teaching. Her work continues! Thank you, Debbie. Doris's voice and contributions were formidable and appreciated. Debbie, Thank you for this post. What a giant in the field. We owe so much to her diligence and passion. Doris was passionate and fierce. She never shied away from controversy and never took “no” for an answer. Her heart was always with the Indian community’s children; her work and her prayers focused on keeping them healthy and whole. Thank you so much Debbie for bringing Doris' story forward for the world to see. Participating with the work of the Broken Flute and the Oyate of that era was important for me as I began to emerge from being a graduate student to an academic. The lens of children's literature is so critical in the process of identity development and cultural consolidation for Indigenous children all over the world. This summer a young Brazilian graduate student will come up to use my office to add to her way of thinking about children's literature from a pedagogical standpoint. She and her advisor were impressed with the Broken Flute and Debbie's work on the blog. Before appropriation was a big issue in mainstream Indigenous literature, Doris the librarian, was there in protest to provide a model for us to follow. 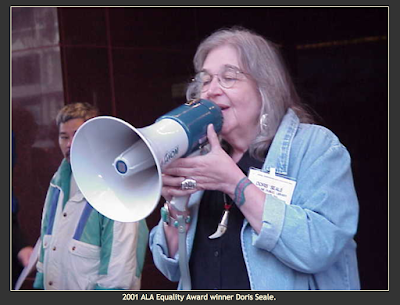 RIP Doris Seale...may your grandchildren and greatgrandchildren and great great grandchildren be like stars in the sky, critically aware of the disceptions of cultural appropriation and misrepresentation in children's literature. From the earliest days of thinking about multicultural literature, Doris led the way. I am enormously indebted to her speaking out, as was and is needed. Her legacy will live on. Rest in peace, Doris. and thank you.